We present to you “Our People and Charity”, a blog instalment introducing the stories of our colleagues who work within the venues and their commitment and support to raise money for great causes. This month we spoke with Devon Martin, the Charity event organiser at Yarnfield Park, part of The Venues Collection. 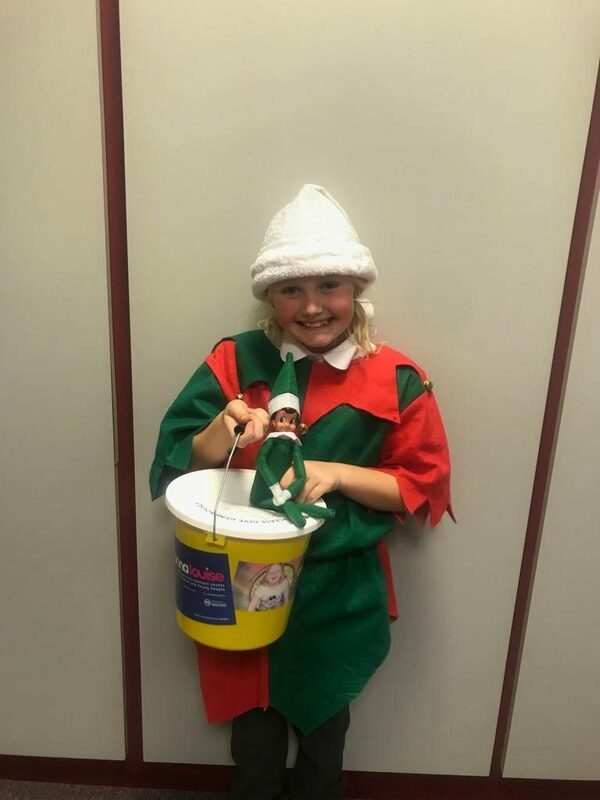 Devon talked to us about the latest charity fundraising event at Yarnfield Park and what motivated her and the team to support this great cause. “Here at Yarnfield Park, we are extremely proud of the work we have done to support the Donna Louise Children’s Charity. The Donna Louise Children’s Charity is a local charity that provides care and support services for children and young adults with shortened life expectancy or those who, due to illness or injury have a life-threatening or life-limiting condition. As a registered charity, they rely on the generosity and help of supporters and businesses across Staffordshire and Cheshire. This is where as a venue we try to help the best that we can. 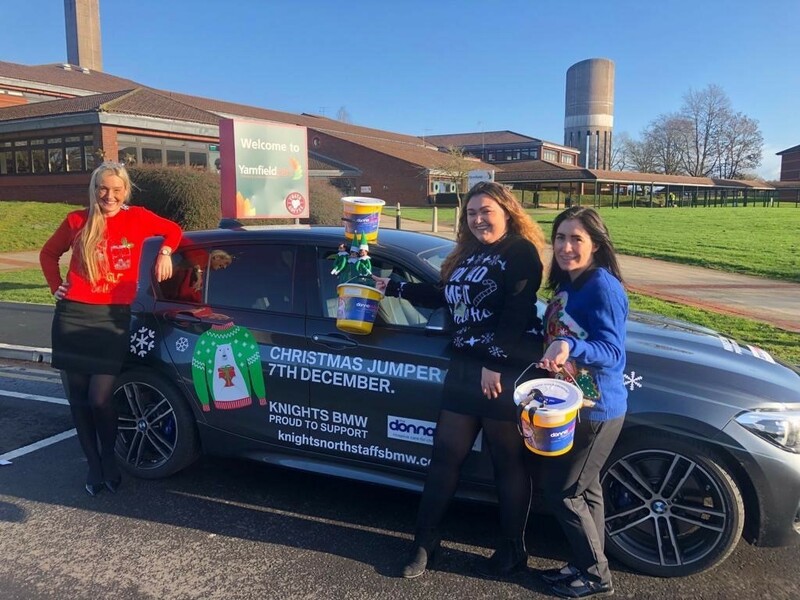 Having worked with The Donna Louise for a number of years we have run a variety of different fundraising events from dress down days, Christmas jumper days, and our most recent Christmas Fayre which raised £398.00. Supporting The Donna Louise charity connects us to the community and allows us to support them in making a real impact. Our aim in supporting this charity is to make a difference to the young lives in Staffordshire. 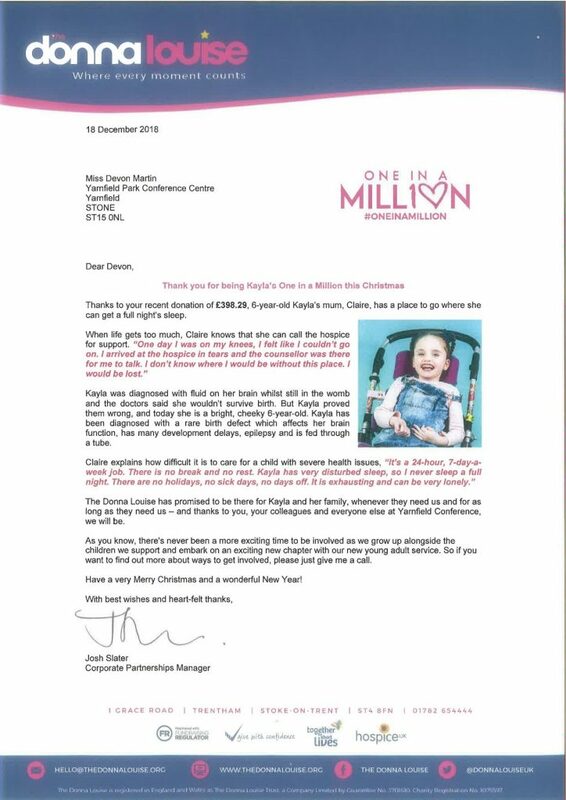 Find attached letter from Joshua Slater the Partnership Manager at The Donna Louise detailed where the money had be allocated and the ways in which it is helping. We cannot imagine what is must be like being a parent of a child with a life limiting disease, so raising money for The Donna Louise I know it’s going to make a major impact on someone’s life. The work that The Donna Louise does touches my heart in many ways and the opportunities it provides is endless and is such a tremendous charity. Just being able to see the positive impact you are making on a child’s life is surely better than anything anyone could ever ask for. That is why I will continue to raise money through events for The Donna Louise.